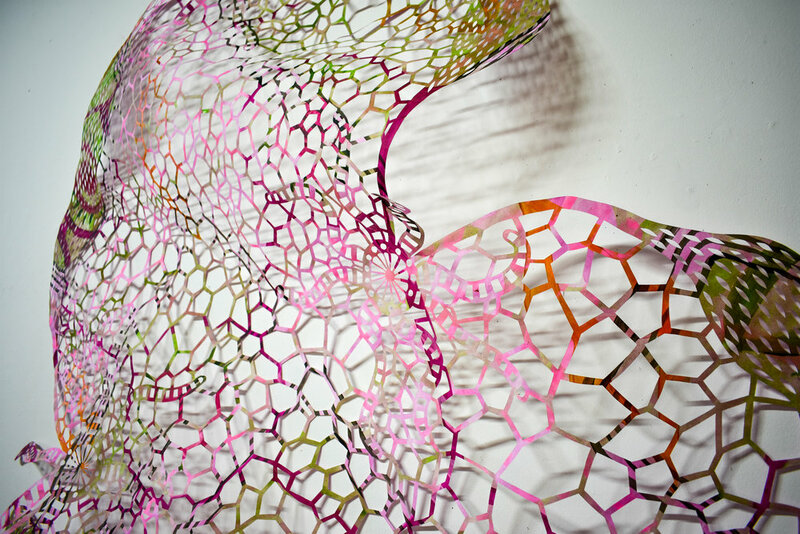 Using what are considered craft mediums, such as crochet, knitting, cut-paper and ceramics, I create sculptures and installations reminiscent of living organisms and environments wildly distorted in size, shape and color. I think of my work not just as a series of pieces, but a living world of interrelated species and with them, I aim to question our stereotypical notions of what we consider craft vs. art. I am interested – almost obsessively – with repetitive, intricate, tedious detail and I create or cover my works with all-encompassing patterns. Our culture has classist notions of what is considered high vs. low art but I use the accessibility of crafts - its beauty, tactileness, color and decoration - to create work that can allow viewers to approach, be curious about, sometimes even play with and hopefully ask themselves what is craft and what is art?